Gastric ulcers affect over 50% of horses1 and can affect any horse at any age. There are two forms of equine gastric ulcers; squamous ulcers and glandular ulcers. These two forms of the disease relate to the two regions of the equine stomach. The lighter pink, squamous region of the equine stomach sits above the darker pink, acid-producing glandular region. In normal circumstances it does not come into contact with gastric acid and therefore has no natural defences against the erosive effects of the acid. In some circumstances the squamous region does come into contact with gastric acid. Repeated or prolonged exposure results in the formation of squamous ulcers1. The underlying cause of glandular ulcers is not well understood and is the focus of much study. They are found in the darker pink, glandular region of the stomach. The glandular region is responsible for the production of gastric acid and therefore has natural defences in place to protect the stomach wall from any damage caused by acid. 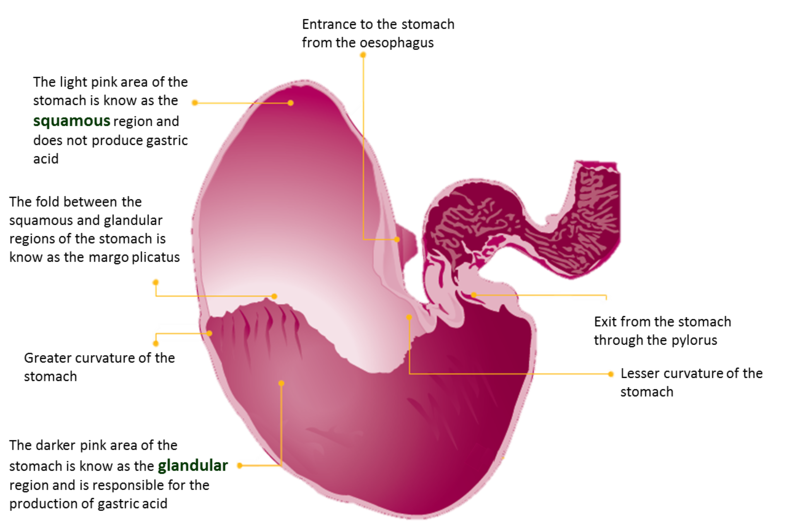 It is thought that glandular ulcers result from a breakdown in these natural defences, therefore making the stomach lining more susceptible to the erosive effects of gastric acid1. Talk to Cheltenham Equine Vets about the signs? Which horses have an increased risk of gastric ulcers? If your horse experiences any of the factors above, any changes you can make to reduce the impact of these will help reduce their risk of developing gastric ulcers. However, there are some circumstances where one or more of the risk factors are unavoidable, for example travelling to competitions. In these situations please call us to discuss preventative treatments that may be suitable. Sykes BW, et al. ECEIM Consensus Statement – EGUS in Adult Horses. J Vet Intern Med 2015; 29: 1288-1299.